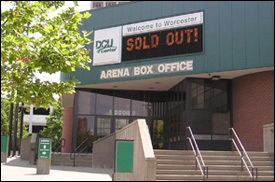 WORCESTER, MA (CelebrityAccess MediaWire) — On January 22nd, The City of Worcester kicked off the start of a $23 million dollar renovation and expansion project at the SMG-managed DCU Center. DCU Center staff was joined by officials from the city and state as well as Lt. Governor Timothy P. Murray to mark the event with a ceremonial column breaking. Both the exterior and interior of the arena will see renovations and plans include a redesigned box office, four new event suites, retail spaces along an expanded concourse and revamped restrooms as well as upgrades to the mechanical, electrical, and plumbing systems. As a part of the construction process, the arena will go dark for 5 months from May to September of this year with a planned reopening in October. The project is being funded through taxes from a special Finance District created by the city of Worcester that will provide revenue for payments on construction loans.